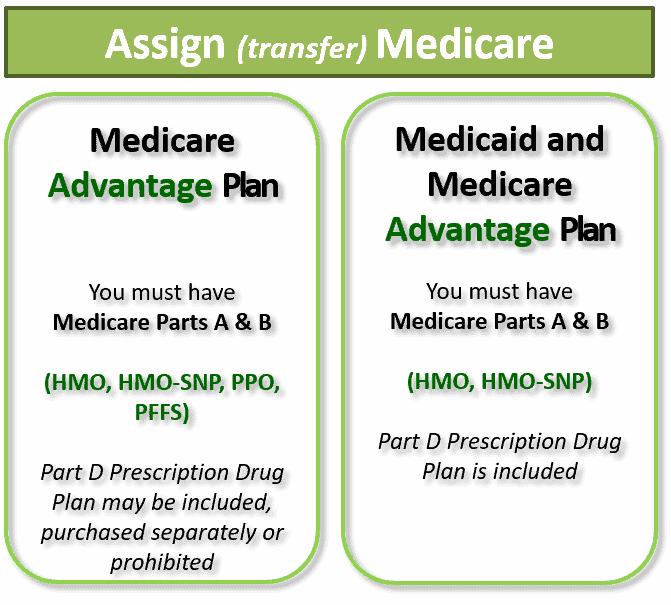 Your first option is to select Medicare Parts A and B. Not many folks stop there but it is an option. If you choose to supplement Medicare, you may select one of two options if available to you. 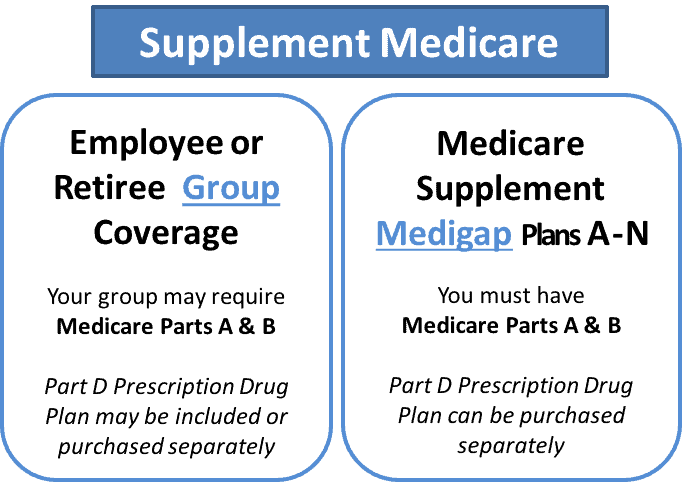 You may choose a federally standardized Medicare Supplement also known as Medigap policy or group insurance from your current employer (employee group) or a previous employer (retiree group). If you choose to replace your Medicare benefits, you may choose one of two options, if available to you. 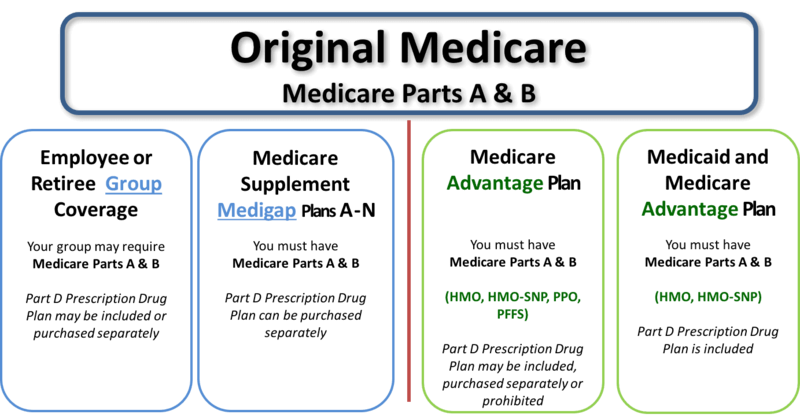 You may choose a federally standardized Medicare Advantage Plan, also known as Part C, or Medicaid if you qualify financially. Is keeping your doctors important? 1. Search all Medicare Advantage networks in your geographic area to determine the networks in which your doctor participates. 2. If you find your doctors, then you may consider the Medicare Advantage plans a viable option. 3. If you do not find your doctors you may consider Medicare and a Medicare Supplement (Medigap) your viable option. Is saving money on prescription drugs important? 1. Make a list of exactly what you take. The exact name of the drug, the dosage and amount needed for each day. If mail order is more cost effective the plan will reveal the results automatically. 2. Visit Medicare’s website ( www.Medicare.gov ) to review every drug plan from every company at the same time. Would having the the lowest monthly premium be important? 1. Schedule time with one of our certified planners to review every plan from every company at the same time. We are available via chat, Facetime, in person, Skype or telephone. We will likely save you thousands in unnecessary premiums, co-pays and deductibles. 2. Attend an informational workshop in your area! 123EasyMedicare.com is a division of 123EasyInsure.com. ©2017 David P Schaeffer. All rights reserved.Individual savings may vary, and are not guaranteed. Coverages and discounts subject to state availability and individual eligibility. ** This is not a complete listing of plans available in your service area. For a complete listing please contact 1-800-MEDICARE (TTY users should call 1-877-486-2048), 24 hours a day/7 days a week or consult www.medicare.gov. *** 123EasyMedicare.com takes no responsibility and assumes no liability for any content posted by consumer or any third party. 123EasyInsure.com is a licensed and certified representative of a Medicare Advantage [HMO, PPO and PFFS] organization and a stand-alone prescription drug plan with a Medicare contract. Enrollment in any plan depends on contract renewal. By clicking the "Submit” button, you are agreeing by electronic signature to give 123EasyMedicare.com prior express written consent to call you at the phone number you provided in the above form (even if it is a mobile phone number) to market our product and services to you and for any other purpose. By clicking the button, you also agree that we may use a computer or other automatic dialing technology to call you. Even if computerized dialing is used, there will be a human, not a recorded message, on the call when you pick up. If you do not answer a message will be left automatically. Clicking any button is not a condition to purchase. By completing the contact form above or calling the number listed above, you will be directed to a licensed sales agent who can answer your questions and provide information about Medicare Advantage, Part D, or Medicare Supplement insurance plans. Neither 123EasyMedicare.com nor its agents are connected with or endorsed by the U.S. government or the federal Medicare program. Availability of carriers and products are dependent on your resident zip code.